Comic books movies, especially early on, before they're well-explored, tend to inspire two perhaps contradictory emotional reactions in fans: on one hand, rabid excitement, and on the other, abject terror. Comic book kids are all eager to see a brilliant adaptation of a favorite graphic storyline, and they're massively appreciative when one works out (as many were for Sin City), but they also realize that the vast majority of comic adaptations crash and burn, failing to capture any of the essential elements of the adapted story. 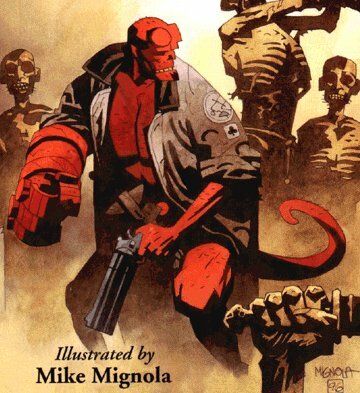 Hellboy, for instance, embodied both sides of the equation. Mike Mignola's fans are diehards, and they were overjoyed to see Ron Perlman cast as Hellboy. They were ready for a beautiful, brutal gothic/mid-century throwdown. Unfortunately, they got a movie that represented the title character well, but dropped the ball on the supporting cast and the atmosphere. There was scarcely a gothic arch, and the World War II occultism was crowded out by big shiny apparatuses that looked more like plastic than tarnished metal. The themes of self-realization, defiance, and creeping Lovecraftian danger were dissolved in a messy stew of comic book cliches: we have to keep our identities secret! Love will save the day! So for many Hellboy nerds (me especially), the dream was deferred, and we hold scarce hope for The Golden Army, which seems to be beset with more of the same downfalls. There's another comic book movie coming out, based on what might be the most influential modern comic series, though it's certainly not the best-known. This comic series, since resold as a convenient graphic novel, is Watchmen. Alan Moore's graphical urban epic was about the demise of heroism, the struggle with real-world moral issues, and the consequences of disillusionment and war in a post-industrial society. It was complex and challenging, and a true masterpiece of the medium. A film adaptation has been in the works for a while, and it's finally been created under the direction of Zack Snyder. When I first heard about this, it inspired the "fear" reaction. It's hard to imagine an accurate recreation of the world of Watchmen... it's a decaying, rusty New York City, but not a Gotham City kind of way. It's mostly shown in daylight, and the dregs of the city are bored locals and homeless vagrants, rather than innocent old ladies and the criminals who beset them. It's not a dangerous world, but rather a listless, uneventful world, shuffling toward the end of history. It's also a world of the 80's, and it still emanates nostalgia, remembering the Hollywood/disco glory of its 70's superheroes. These heroes, all retired after a wave of social reform, are the protagonists of Moore's story. This is a complex milieu, and it's next to impossible to recreate on film, I would imagine. It's almost cheesy enough to cover the superheroes in skin-tight primary-color spandex, but Moore's world isn't quite ready to make that much of a mockery of itself. It has to find a postmodern balance between edgy and used up... between updated and outdated. This is why I was afraid for the film. I really couldn't imagine how any creative director could strike the balance required to make the world work. From the initial stills from the movie, though, it seems that Snyder may be on his way to doing it right. He's picked some perfect actors, like the gaunt, severe Jackie Earle Haley as Rorschach. On top of the casting, we've seen some initial images of costume and production design, and these do a miraculous job of achieving the right look. The outdoor shots look great: the city is gritty and unadorned at night, and it's blank and pedestrian during the day. The costumes are bulky and plastic, which is probably necessary to reproduce the intentional kitsch in Alan Moore's art, but they're also dark and unironic, the stuff of superheroes who are vengeful, ready to return to their work in the world. So I've gone from frightened to excited... from apprehensive to hopeful. This movie could really work. Now Snyder's production company has to gather the myriad themes and narrative threads in Moore's book, and they have to build them into a fluid, well-paced action movie with some believable moments of psychology and introspection. He hasn't won me over yet, but hey, I'm ready to watch.